Along the River Thames In London there are the obvious signs of its industrial and global shipping past. Redundant machinery, abandoned wharfes and slipways point to this industrial and commercial history, but if you look hard enough at the foreshore you can find more personal items associated with the people who lived or worked on the river. Pictured are a number of old clay pipes and a toy marble, all dating from many years ago. ‘Mud larks’ will tell you that they tend to find shattered crockery, many clay pipes (mostly the shaft), bottles and oyster shells. 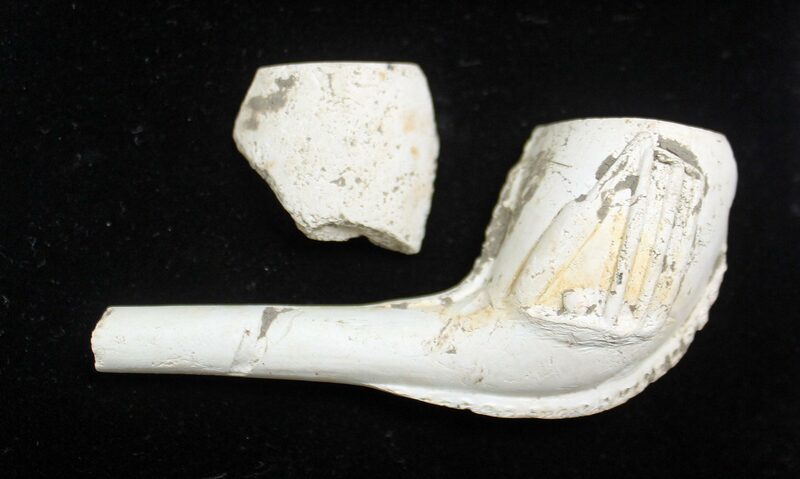 This is because clay pipes were the cigarettes of the day and oysters a staple of a cheap meal. It was also generally believed that smoking protected you from disease and that alcohol was safer than water. Oysters were ‘cheap as chips’ and not a luxury food as they are now. If you had a pipe, a beer and some oysters you had a working lunch in the 18 and 19th century. These above items were picked up from the foreshore at Vauxhall and Greenwich. Living in central London it’s not that easy to pop out to enjoy ‘fresh’ air etc., without travelling so I do spend quite a bit of time on Vauxhall ‘beach’ which is a short walk from home. Every now and then I come across something cool and this time I found a clay pipe (the cheap smoke before ‘roll ups’) in the mud. What makes this pipe nice is that I have a good chunk of it and it has a cricket motif. Just over a kilometre away is the Oval Cricket Ground so it’s not hard to think that there might be connection – rubbish from the Oval or dropped by a fan or player? Because the pipe is decorated and of a moderate size (tobacco was expensive early on) suggests it’s reasonably old, probably mid to early 1800’s and this would tie in with the development of the area and the making of the Oval in the 1830’s from what was Kennington Common. The next time I’m on the foreshore I hope to find a clay pipe with a cyclist or bike motif as the Oval once also had a velodrome around the boundary.